Konstsmide Snowflake is a magical light set which will transform the exterior of your home with enchanting illumination for the festive season. 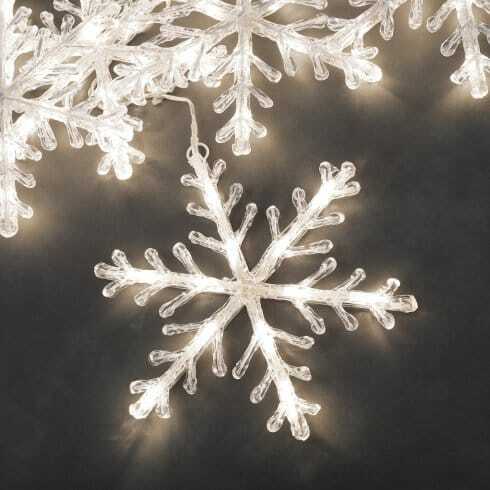 Featuring 5 large snowflakes with 60 warm white LED's incorporated throughout the design which provides bright sparkling light and is a warm and welcoming addition to your winter garden decorations this Christmas. Suitable for indoor and outdoor use and includes a transformer,must be plugged into an indoor socket. The set comes complete with string which and loops on each end making it easier to hang on hooks or guttering already in place.